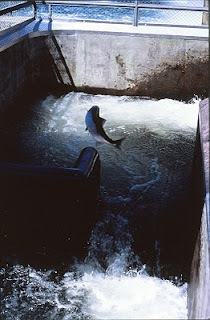 Friends of the Ballard Locks: Spring Cleaning: Preparing the Fish Ladder for Salmon! While it's drained, why not install of couple of webcams. That way people could check online to see if the salmon are running before makeing the trip out to the Locks. 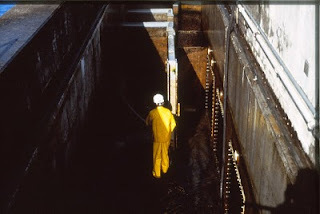 What a beautiful peice of machienary built to allow salmon to pass between fresh and salt water, and to navigate the locks. Glass panels below the water line make it possible to watch the fish as they swim through the ladder.